The Territory of Cocos (Keeling) Islands, also called Cocos Islands and Keeling Islands, is a territory of Australia. There are two atolls and twenty-seven coral islands in the group. The islands are located in the Indian Ocean, about one-half of the way from Australia to Sri Lanka, at 12°07′S 96°54′E. Captain William Keeling was the first European to see the islands, in 1609, but they remained uninhabited until the nineteenth century, when they became a possession of the Clunies-Ross family. Slaves were brought to work the coconut plantation from Indonesia, the Cape of Good Hope and East Asia by Alexander Hare who had taken part in Stamford Raffles' takeover of Java in 1811. A merchant seaman called Captain John Clunies-Ross, who had also served under Raffles in the takeover, set up a compound and Hare's severely mistreated slaves soon escaped to work under better conditions in the Clunies-Ross compound. 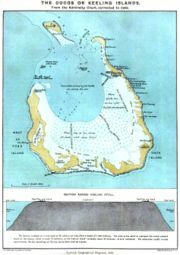 On 1 April 1836, HMS Beagle under Captain Robert FitzRoy arrived to take soundings establishing the profile of the atoll. To the young naturalist Charles Darwin who was on the ship the results supported a theory he had developed of how atolls formed. He studied the natural history of the islands and collected specimens. His assistant Syms Covington noted that "an Englishman and HIS family, with about sixty or seventy Mulattos from the Cape of Good Hope, live on one of the islands. Captain Ross, the governor, is now absent at the Cape." The islands were brought under the British Empire in 1857. In 1867, their administration was placed under the Straits Settlements, which later became known as Singapore. Queen Victoria granted the islands in perpetuity to the Clunies-Ross family in 1886. 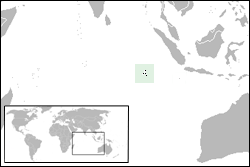 The Cocos Islands under the Clunies-Ross family have been cited as an example of a 19th century micronation. On 9 November 1914, the islands became the site of the Battle of Cocos, one of the first naval battles of World War I. The telegraph station on Direction Island, a vital link between the United Kingdom, Australia and New Zealand, was attacked by the German light cruiser SMS Emden, which was destroyed several hours later by the Australian cruiser, HMAS Sydney . During World War II the cable station was once again a vital link. The islands were also noted as a covert base for enemy German raider cruisers, which operated in the Indian Ocean. Following the entry of Japan into the war, Japanese forces occupied neighbouring islands. To avoid drawing their attention to the Cocos cable station and its islands' garrison, the seaplane anchorage between Direction and Horsburgh Islands was not used. Radio transmitters and receivers were also not used, except in emergencies. After the Fall of Singapore in 1942, the islands were administered from Ceylon (Sri Lanka), while West and Direction Islands were placed under Allied military administration. The islands garrison initially consisted of a platoon from the British Army's King's African Rifles, located on Horsburgh Island, with two 6-inch guns to cover the anchorage. The local inhabitants all lived on Home Island. Despite the importance of the islands as a communication centre the Japanese made no attempt either to raid or to occupy them and contented themselves with sending over a reconnaissance aircraft about once a month. On the night of 8-9 May 1942, fifteen members of the garrison, from the Ceylon Defence Force mutinied, under the leadership of Gratien Fernando. The mutineers were said to have been provoked by the attitude of their British officers, and were also supposedly inspired by anti- imperialist beliefs. They attempted to take control of the gun battery on the islands. The Cocos Islands Mutiny was crushed, although they killed one non-mutinous soldier and wounded one officer. Seven of the mutineers were sentenced to death at a trial which was later alleged to have improperly conducted. Four of the sentences were commuted but three men were executed, including Fernando. These were to be the only British Commonwealth soldiers to be executed for mutiny during the Second World War. On 25 December 1942, the Japanese submarine I-166 bombarded the islands but caused no damage. Later in the war two airstrips were built and three bomber squadrons were moved to the islands to provide to conduct raids against Japanese targets in South East Asia and to provide support during the reinvasion of Malaya and reconquest of Singapore. They included some Liberator bombers from No. 321 (Netherlands East Indies) Squadron RAAF (members of exiled Dutch forces serving with the Royal Australian Air Force), were also stationed on the islands. When 99 and 356 RAF squadrons arrived on West Island they brought with them a daily newspaper called Atoll which contained news of what was happening in the outside world. Run by airmen in their off-duty hours it achieved fame when dropped by Liberator bombers on POW camps over the heads of the Japanese guards. In 1946 the administration of the islands reverted back to Singapore. On 23 November 1955, the islands were transferred to Australian control under the Cocos (Keeling) Islands Act 1955. In 1978, Australia entered a form of purchase of the islands with the Clunies-Ross family. The Cocos (Keeling) Islands consist of two flat, low-lying coral atolls with an area of 14.2 km² (5.4 sq. mi), 2.6 km (1.6 mi) of coastline, a highest elevation of 5 m (16 ft) and thickly covered with coconut palms and other vegetation. The climate is pleasant, modified by the southeast trade winds for about nine months of the year and with moderate rainfall. Cyclones may occur in the early months of the year. 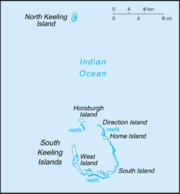 North Keeling Island is an atoll consisting of just one C-shaped island, a nearly closed atoll ring with a small opening into the lagoon, about 50 m (165 ft) wide, on the East side. The island measures 1.1 km² (272 acres) in land area and is uninhabited. The lagoon is about 0.5 km² (124 acres). North Keeling Island and the surrounding sea to 1.5 km from shore form the Pulu Keeling National Park, established on 12 December 1995. 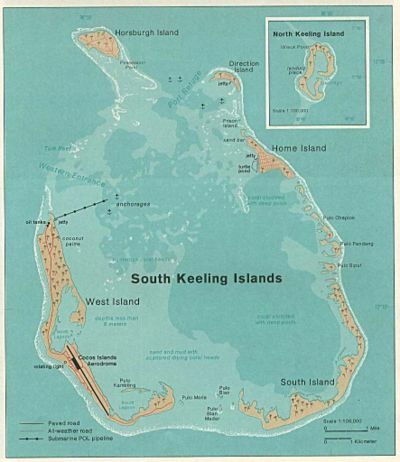 South Keeling Islands is an atoll consisting of twenty-six individual islets forming an incomplete atoll ring, with a total land area of 13.1 km² (5.1 sq mi). Only Home Island and West Island are populated. People from Home Island maintain weekend shacks on the lagoon shore of South Island and on some of the smaller islands. The islands with zero areas have vanished. There are no rivers or lakes on either atoll; fresh water resources are limited to rainwater accumulations in natural underground reservoirs. Cocos (Keeling) Island is located on almost exactly the opposite side of the globe as Cocos Island, Costa Rica. As of 2004, there are 629 inhabitants of the Cocos (Keeling) islands. The population on the two inhabited islands generally is split between the ethnic Europeans on West Island (est. pop. 120) and the ethnic Malays on Home Island (est. pop. 500). A Cocos dialect of Malay and English are the main languages spoken and 80% of Cocos Islanders are Sunni Muslim. The capital of the Territory of Cocos (Keeling) Islands is West Island while the largest settlement is the village of Bantam ( Home Island). Governance of the islands is based on the Cocos (Keeling) Islands Act of 1955 and depends heavily on the laws of Australia. The islands are administered from Canberra by the Department of Transport and Regional Services, through a non-resident Administrator appointed by the Governor-General. The current Administrator is Neil Lucas, who was appointed on 30 January 2006 and is also the Administrator of Christmas Island. These two Territories comprise Australia's Indian Ocean Territories. There also exists a unicameral Cocos (Keeling) Islands Shire Council with seven seats. A full term lasts four years, though elections are held every two years; approximately half the members retire each two years. Federally, Cocos (Keeling) Islanders form the electorate of Lingiari with Christmas Island and outback Northern Territory. The islands have a five-person police force but their defence remains the responsibility of Australia. Grown throughout the islands, coconuts are the sole cash crop. Copra and fresh coconuts are the major export earners. Small local gardens and fishing contribute to the food supply, but additional food and most other necessities must be imported from Australia. There is a small but growing tourist industry. The Cocos Islands Cooperative Society Ltd. employs construction workers, stevedores, and lighterage worker operations. Tourism employs others. The unemployment rate was estimated at 60% in 2000. The islands are connected within Australia's telecommunication system (with number range +61 8 9162 xxxx) and postal system ( post code: 6799). There is one paved airport (on the West Island) and a lagoon anchorage. The region's internet top-level domain is .cc.